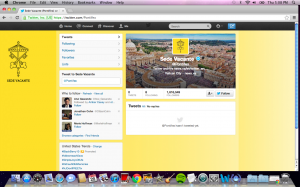 The Vatican didn't waste any time before deleting the newly resigned pope's entire Twitter feed. But as Monsignor Paul Tighe, secretary of the Pontifical Council for Social Communications, told Forbes, the account is simply inactive until the next pope is selected and is not "shut down." "Let us imitate the Virgin Mary in welcoming and guarding the word of Jesus, in order to recognize him as Lord in our lives," and "Today I have a special thought for every religious: may they always follow Christ faithfully in poverty, chastity and obedience." Can't get enough Benedict news? You can follow the unofficial @PopeBenedictXIV account here.